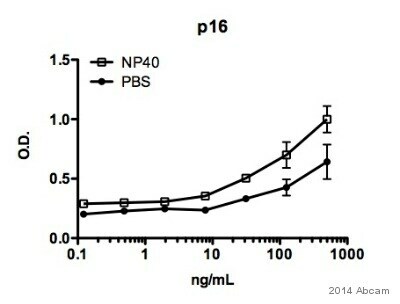 This antibody shows no cross reactivity with the closely related inhibitors p15INK4b and p18INK4c. WB: HEK-293 and HeLa cell lysates. Flow cyt: HEK-293 cells. IHC-P: Bladder tumor tissue. Our Abpromise guarantee covers the use of ab16123 in the following tested applications. WB Use at an assay dependent concentration. Detects a band of approximately 16 kDa (predicted molecular weight: 16 kDa). Immunohistochemical analysis of formalin-fixed, paraffin-embedded bladded tumor tissue labelling CDKN2A/p16INK4a with ab16123 at 10µg/ml. ICC/IF image of ab16123 stained Hepp cells. The cells were 4% formaldehyde fixed (10 min) and then incubated in 1%BSA / 10% normal goat serum / 0.3M glycine in 0.1% PBS-Tween for 1h to permeabilise the cells and block non-specific protein-protein interactions. The cells were then incubated with the antibody (ab16123, 1µg/ml) overnight at +4°C. The secondary antibody (green) was Alexa Fluor® 488 goat anti-mouse IgG (H+L) ab150113) used at a 1/1000 dilution for 1h. Alexa Fluor® 594 WGA was used to label plasma membranes (red) at a 1/200 dilution for 1h. DAPI was used to stain the cell nuclei (blue) at a concentration of 1.43µM. Overlay histogram showing HEK293 cells stained with ab16123 (red line). The cells were fixed with 4% paraformaldehyde (10 min) and incubated in 1x PBS / 10% normal goat serum / 0.3M glycine to block non-specific protein-protein interactions. The cells were then incubated with the antibody (ab16123, 1µg/1x106 cells ) for 30 min at 22ºC. The secondary antibody used was DyLight® 488 goat anti-mouse IgG (H+L) (ab96879) at 1/500 dilution for 30 min at 22ºC. Isotype control antibody (black line) was mouse IgG1 [ICIGG1] (ab91353, 2µg/1x106 cells) used under the same conditions. Acquisition of >5,000 events was performed. This antibody gave a positive signal in HEK293 cells fixed with 100% methanol used under the same conditions.